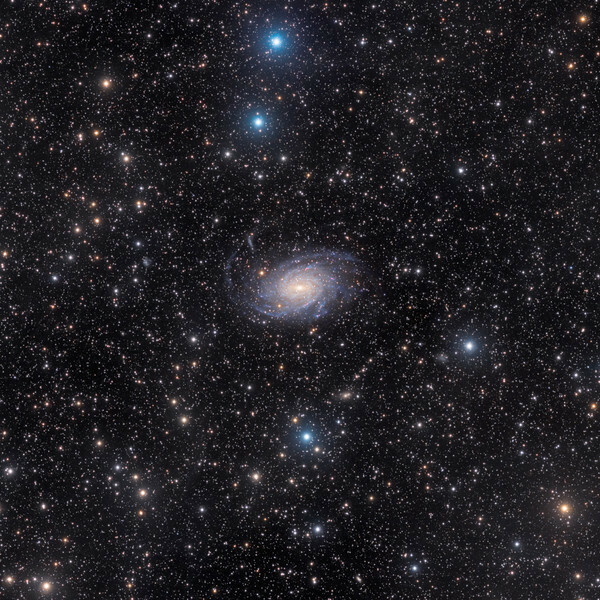 NGC 6744 (also known as Caldwell 101) is an impressive spiral galaxy that lies about 30 million light-years away in the southern constellation of Pavo (the Peacock). But this view could almost be a picture postcard of our own Milky Way, taken and sent by an extragalactic friend, as this galaxy closely resembles our own. We see NGC 6744 almost face-on, meaning we get a dramatic bird’s eye view of the galaxy’s structure. If we had the technology to escape the Milky Way and could look down on it from intergalactic space, this view is close to the one we would see — striking spiral arms wrapping around a dense, elongated nucleus and a dusty disk. There is even a distorted companion galaxy — NGC 6744A, seen here as a smudge to the upper left of NGC 6744, which is reminiscent of one of the Milky Way’s neighboring Magellanic Clouds. One difference between NGC 6744 and the Milky Way is their size. While our galaxy is roughly 100,000 light-years across, the galaxy pictured here extends to almost twice this diameter. Nevertheless, NGC 6744 gives us a tantalizing sense of how a distant observer might see our own galactic home. This dramatic object is one of the largest and nearest spiral galaxies. Although it has a brightness of about 60 billion Suns, its light spreads across a large area in the sky — about two-thirds the width of the Full Moon, making the galaxy appear as a hazy glow with a bright center through a small telescope. Still, it is one of the most beautiful objects in the southern sky, and it can be identified by amateur astronomers as an oval shape contrasting with a rich background of stars (text adapted from astronomy.com).